- trip computer (refer to the "Instruments and controls" section). Warning messages (E.g. "Emisions control system faulty") or information messages (E.g. : Automatic headlamps active") may appear temporarily. These can be cleared by pressing the "ESC" button. press the "ESC" button to abandon the operation in progress. - personalisation-confi guration, - telephone (hands-free kit). Press the "  " or "  " buttons to select the menu required, then confi rm by pressing the "OK" button. With the Audio system switched on, once this menu has been selected you can activate or deactivate the functions linked with use of the radio (RDS, REG, RadioText), the CD (introscan, shuffl e, CD repeat) or the MP3 player (USB port/jack socket). For further details on the "Audio functions" application, refer to the Audio system part of the "Audio and Telematics" section. - defi ne the vehicle parameters, - display confi guration, - selection of the language. - wiper linked to reverse gear (refer to the "Visibility" section), - "guide-me-home" lighting , - parking assistance (refer to the "Driving" section). Press the " " or "
the "OK" button to select the menu required. 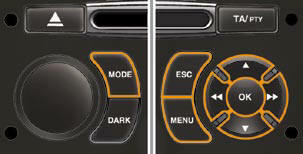 then the "OK" button to select the "Guide-me-home lighting" line. set the value required (15, 30 or 60 seconds), then press the "OK" button to confi rm. the "OK" button to select the "OK" box and confi rm or press the "ESC" button to cancel. - brightness-video setting, - date and time setting, - selection of units. Once the fuel consumption units have been changed to mpg, the information in the screen relating to speed and distance also changes to mph and miles respectively. Once this menu has been selected, you can change the language used by the display (Deutsch, English, Espanol, Français, Italiano, Nederlands, Portugues, Portugues-Brasil, Türkçe *). With Audio system on, once this menu is selected you can confi gure your Bluetooth hands-free kit (pairing), view the various telephone directories (list of calls, services...) and manage your calls (call, hang up, second call, secret mode...). 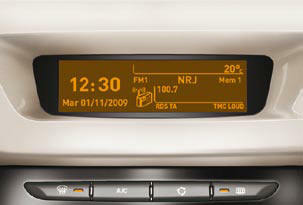 For more details on the "Telephone" function, refer to the Audio system part of the "Audio and telematics" section. For safety reasons, confi guration by the driver of the multifunction screen must only be done when stationary.